The hometown fans in Bangkok were left disappointed in the first two matches of the day, but were sent home with smiles on their faces after the last match of the day. 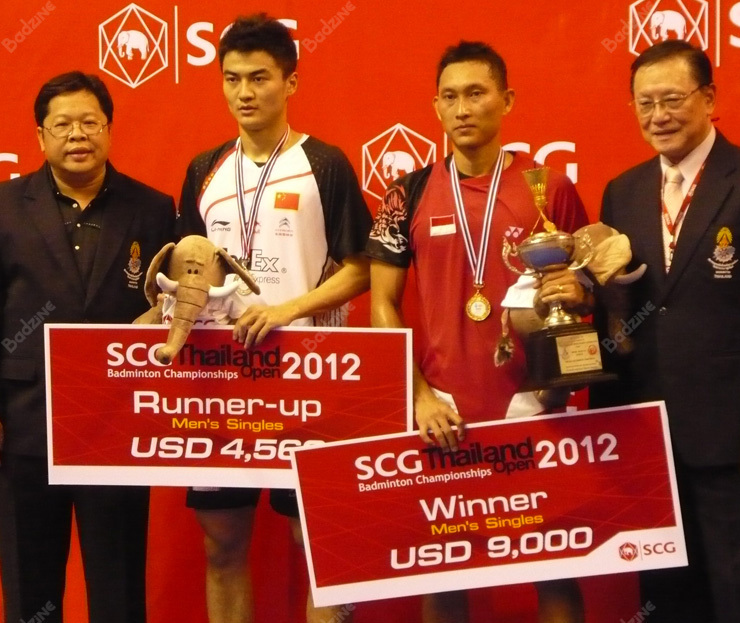 Veterans from Indonesia, India, China and Thailand and one very notable Thai youngster took their places on the winner’s podium, as the SGC Thailand Open 2012 reached its conclusion on Sunday. Indonesia’s Sony Dwi Koncoro and India’s Saina Nehwal captured the single’s titles. Liu Xiaolong and Qiu Zihan, and Tao Jiaming and Tang Jinhua of China took the men’s doubles and mixed doubles titles respectively. 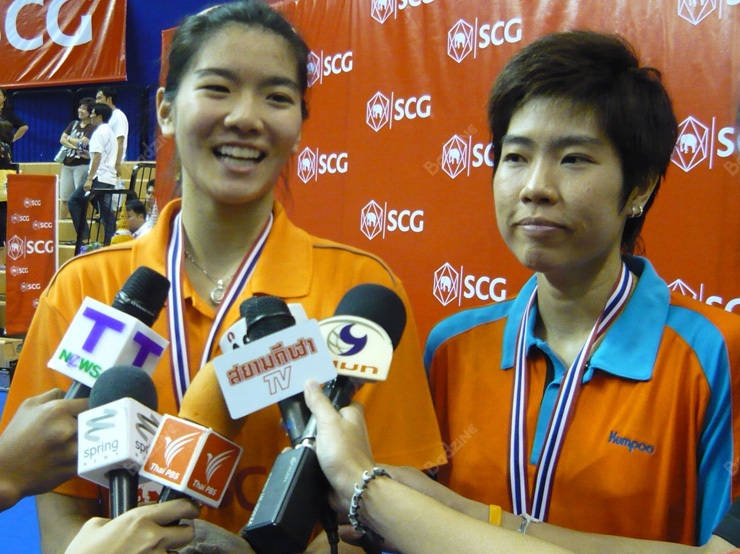 The women’s doubles team of Saralee Thoungthongkam and Narissapat Lam became the first Thai women’s team to win the Thailand Open and sent the partisan Thai fans home with smiles on their faces. The first final on Sunday afternoon, the mixed doubles, saw the unseeded Chinese team of Tao Jiaming and Tang Jinhua defeat Thailand’s number two seeded, Sudket Prapakamol and Saralee Thoungthongkam in a forty-one minute, two game match, 21-14 and 21-16. Although Saralee was able to come back later in the day to capture the women’s doubles crown, at noon, the 32-year-old was already playing her ninth match of the tournament and may have been feeling the effects. The Chinese pair dominated both games as they never trailed after pulling away from a 1-all tie in the first game and a 5-all tie in the second game to take the gold medals home. The twenty-year-old Tang is on the verge of breaking into the top 10 in women’s doubles but this victory came on her first mixed outing as the replacement for her doubles partner Xia Huan. Tao’s other partners in the last couple of years have included such luminaries as Tian Qing, Ma Jin, and even the great Zhang Yawen. Things didn’t get improve enough for Thailand, either in the second match of the day. 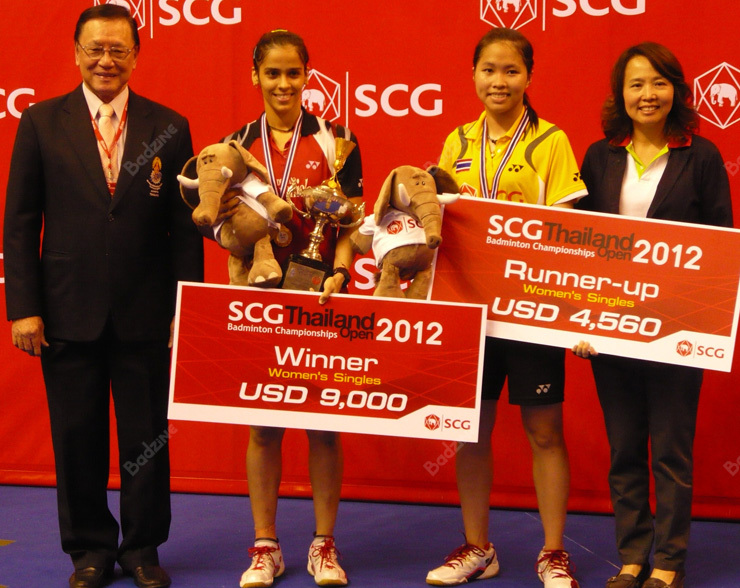 Saina Nehwal showed up on Sunday with hopes of disappointing the Thai fans as she was up against, Ratchanok Intanon, a player who created a sensation when she became Saina’s successor as World Junior Champion at the age of fourteen. Now a seasoned seventeen-year-old and, more importantly, Thailand’s top player in the women’s singles, Ratchanok went down, nevertheless, in three games, with Saina taking it 19-21, 21-15 and 21-10. Intanon came out of the gate swinging in the first game as she jumped out to a 19-12 lead and looked as if she was headed straight for the title. Nehwal didn’t even allow the Thai an easy win in the opening game though, as she rattled off the next five points to put the game in doubt at 17-19. Intanon was able to win the next two points and the game, but Nehwal’s near-comeback provided her with the impetus that would propel her to victory. 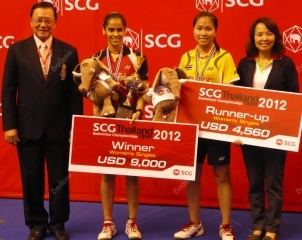 Nehwal, who defeated four Thais and China’s Han Li on her path to victory, added, “I need to build my confidence, the Thai girls all are so good now, beating them and Han Li really helped my confidence, which I need to compete in Indonesia. All the top players will be there. Veteran shuttler Sony Dwi Koncoro, once again showed the top ten form that has eluded him after battling injuries over the last two years. Dwi Koncoro, unseeded at this year’s Open and the former third-ranked ranked men’s singles player in the world, defeated Chen Yuekun of China. Chen, the 158th ranked men’s player in the world, looked strong in jumping out to an early 7-3 lead in the first game. Sony battled back to tie the game at 7-all and after numerous other ties, the last at 14-all, Dwi Koncoro took control of the game to win, 21-17. The second game was never in doubt, as the twenty-seven-year-old Indonesian went on to a 21-14 win to complete his victory and capture his first tournament title since the 2010 Singapore Open. 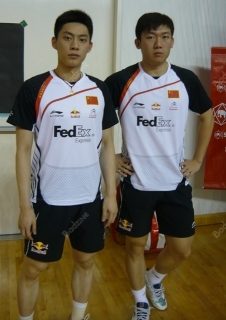 In the men’s doubles discipline, Liu Xiaolong and Qiu Zihan may have been the top-seeded pair, but they were battling to emerge from the obscurity of being the fourth-ranked Chinese pair and of having never won an international title. Sure enough, though, Liu and Qiu justified their position by defeating Malaysia’s veteran team of Mohd Zakry Abdul Latif and Mohd Fairuzizuan Mohd Tazari, 21-18 and 21-19. The Malaysian duo mounted a late comeback in the second game in hopes of evening the match. After falling behind 12-18, Zakry and Fairuzizuan staged a furious comeback to get within one, at 19-20, but fell just short as Liu and Qiu converted the one match point they needed that led them to the winner’s podium. After Thai losses in the first two matches of the day, the Thai fans were left with one last hope for a win in the day’s final match, and based on the seedings, the Thai chances were not good. The unseeded Thai team of sixteen-year-old Narissapat Lam and thirty-two year old veteran Saralee Thoungthongkam were up against the fifth-seeded pair from China, made up of former world #1 Cheng Shu and Pan Pan, who has also spent her share of time in the top 10. The Thai pair however, showed they were more than up for the challenge and defeated the higher seeded Chinese team in an entertaining, three-game match, 21-15, 10-21 and 21-13 that lasted fifty-seven minutes. 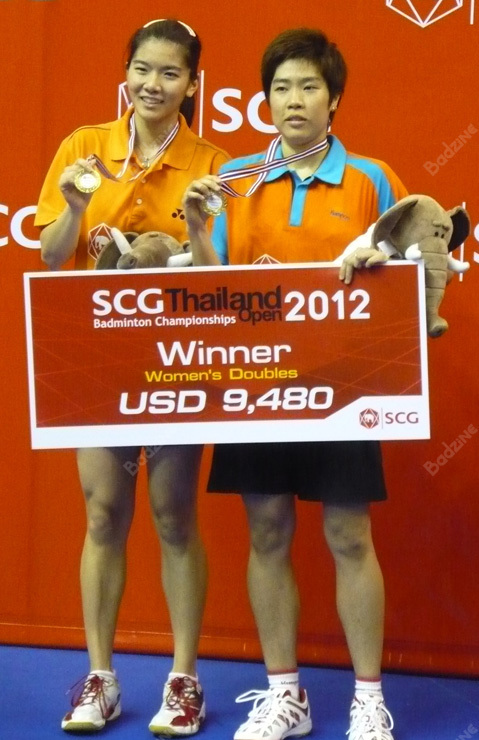 Narissapat joins a very talented crop of young Thai girls who recently surprised the badminton world with a strong third place finish at the recent Uber Cup in Wuhan, China. Partnered with the veteran Saralee since late last year, Narissapat showed poise and promise that belies her young age. More than holding her own as the designated smasher that complements Saralee’s set-up position in the front court, Narissapat showed that she has what it takes to compete at the next level.